Partimus Blog › Successful Raspberry Pi Silent Auction! 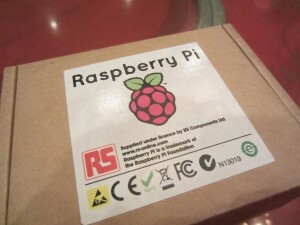 Several months ago James Tatum donated a Raspberry Pi to Partimus to use or sell as a fundraiser. 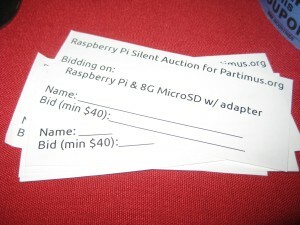 This past week we were finally able to take the time to organize a silent auction at a Bay Area Linux Users Group meeting. There were 3 bidders in the auction, all of whom made generous offers to support Partimus! The winning bid of $100 was accepted. Huge thanks to everyone who participated and to James for the donation that made this auction possible. The meeting itself was about the Scratch programming language, presented by Gary Longoria who used it to teach programming to high school students at the UC Berkeley Pre-College Academy during the summer. It was a really interesting presentation and I’m now hopeful we can find a way to integrate use of this tool in our work with Partimus. This was written by Elizabeth Krumbach Joseph. Posted on Thursday, September 20, 2012, at 3:32 pm. Filed under News. Tagged donations, fundraiser, Raspberry Pi. Bookmark the permalink. Follow comments here with the RSS feed. Post a comment or leave a trackback. ‹ 14 notebooks up and running Ubuntu GNU-Linux!